To the Moon and Beyond (S) 22.04.1964 New York World Fair, USA Cinerama 360. 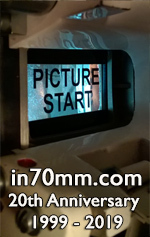 Filmed in 10 perf 70mm at 18 fps. Cinerama Camera Corporation. Sponsored by KLM Royal Dutch Airlines. Later re-released as "Cosmos".